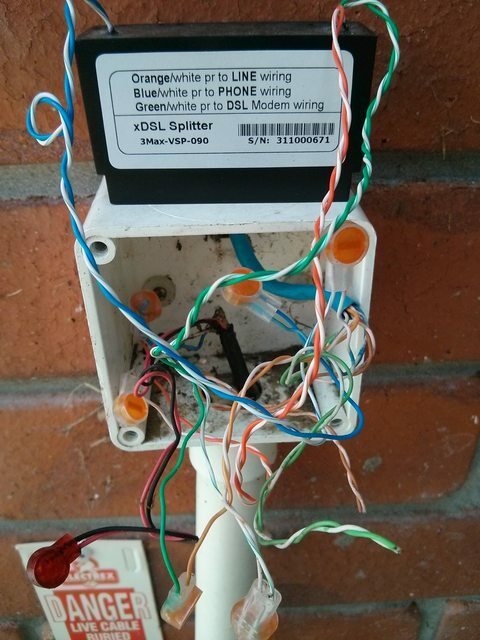 There was already an ADSL2+ splitter in place put their by the alarm installer, sending phone down the orange pair and DSL down the blue pair, which the chorus installer swapped. However the ADSL2+ splitter has not been replaced. The chorus installer said they "are the same" and tested it at the cabinet and confirmed it was working - which it obviously would regardless of what you put in there. Hi, the lattest spec for the new VDSL2 compatible filters requires that three ports are supplied rather than two as in the old spec. If you open most of these new filters you will find the line and DSL port are infact the very same point. The standard does allow and potentially some compliant filter designs allow for a high pass section between the line and DSL port, but all the ones I have tested appear to have only a LP section between the line and phone port and the line and DSL port are the very same point. The old ADSL filter (MM3200B) supplied only a line and phone port, therefore you needed to make a double termination of the line port to provide the DSL from the same port, these newer VDSL2 filters simply give you a third wire port to make is easier to termiate the DSL connection. Obviously these new VDSL2 filters are also rated to 30MHz where as the older ADSL/2+ filters are only rated to 2.2MHz, hence only ADSL2+ capable. As of now there will only be a small remaining stock of the older ADSL2+ filters and only the newer VDSL2 capable filter (as you have a photo of) should be available. These filters are obviously rated for ADSL/ADSL2/ADSL2+ and VDSL2. And if you use one of these filters you run the DSL port to a dedicated socket just for the DSL modem, and the rest of you phone sockets in the house connected to the phone port, so you no longer require inline filters on each phone socket. The bolded bit is quite concerning. There is no POTS on this line but i want the best VDSL conditions possible. AFAIK the filter only filters the phone part, so it shouldn't matter to be honest. Happy to be corrected by someone more knowledgeable on such matters. Got a photo of the splitter? Anything installed in the last few years is almost certainly VDSL compatible. As a rule of thumb - if it has 3 pairs - orange, blue, green, it's OK for VDSL. Its an old 2 pair one, like the old ADSL2+ one sitting on my desk here. I'm going to confirm this and its model next time i'm there, but from memory its the old one - i was explicitly looking for the three pair model, but this one was the old ADSL2+ one with a T join splicer. And yes it filters the phone part, but i'd like to hear from the splitter/wiring gurus whether the phone connections without the newer splitter could affect VDSL performance and whether its worth putting in a new one. Snap have offered to send chorus out again if it is the old ADSL2+ one. eXDee: There is no POTS on this line but i want the best VDSL conditions possible. 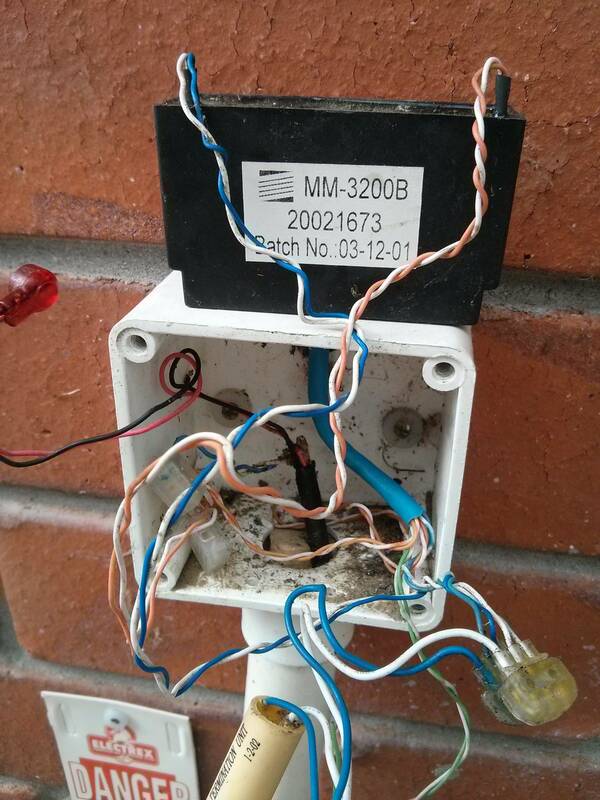 No POTS, structured cabling, why isn't the line patched directly to the VDSL jack without needing a filter? They wanted a splitter wired so that in the future if the tenants (or owners) wanted POTs, it could be used. There are a handful of ports on the patch panel wired like sbiddle's structured cabling guide shows. Theres two 16 port patch panels so plenty of space to go around, and 20+ RJ45 jacks around the house makes for plenty of connectivity. Additionally the wire going down to the ETP is going through brick wall and it's too difficult to run two lines there, hence why its still going through the single CAT5e. But yes i know what you mean. My own setup at home actually has the incoming line connecting directly into a RJ45 plugging into the fritzbox (no patch panel at home). Manufacturer does not list those as being VDSL compliant. That's not a VDSL splitter. Swap it out for a 3-pair splitter. BTW - what part of the country was this done ? Is the Test Termination (master jack substitute) at the bottom of the picture still required? As above, it is not rated to 30Mhz, so what do you think will happen to these higher frequencies? They will have the potential to reflect up the voice line stub and back degrading VDSL performance. To give you an example of how line stub effect performance on VDSL, I recently did some work on someones wiring. They had Naked-VDSL, line come into jack-point 1, then daisy chained on to jack-point 2. 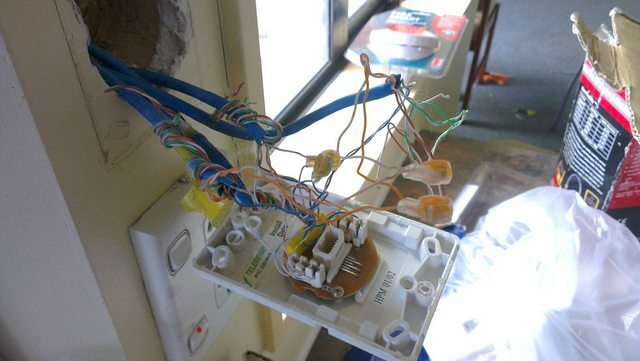 The physical wiring was in perfect condition, VDSL plugged into jack-point 1. I disconnected feed to jack-point 2 from jack-point 1, so line now came in and terminated at jack-point 1 only. Immediate 5Mbps increase in sync speed, which increased another 5Mbps within a couple of weeks. So this extra few metres of line stub resulted in customer missing out on 10 Mbps! Your non compliant ADSL filter has the potential to do the same. Bung: Is the Test Termination (master jack substitute) at the bottom of the picture still required? I would like to know also. I have one at my place. Tempted to just disconnect it anyway. Not sure if these are really needed or not; but where I do leave them in, I always crimp to the voice side of splitter. This was done in Sherwood Park area, in Hamilton East. I had told them that chorus needs to swap the splitter, but upon them telling the installers (old guy and a young guy), the installer said that there are two types and both do ADSL and VDSL, there's no difference and not to believe everything you hear. It's resynced but line stats have not increased sync and attenuation is still the same. We're about to reboot the modem and see what happens. Snap said the line was showing 49 megabit attainable from their end. The cabinet is visible from the end of the driveway, its just across the road (unsure of the path the cable takes).